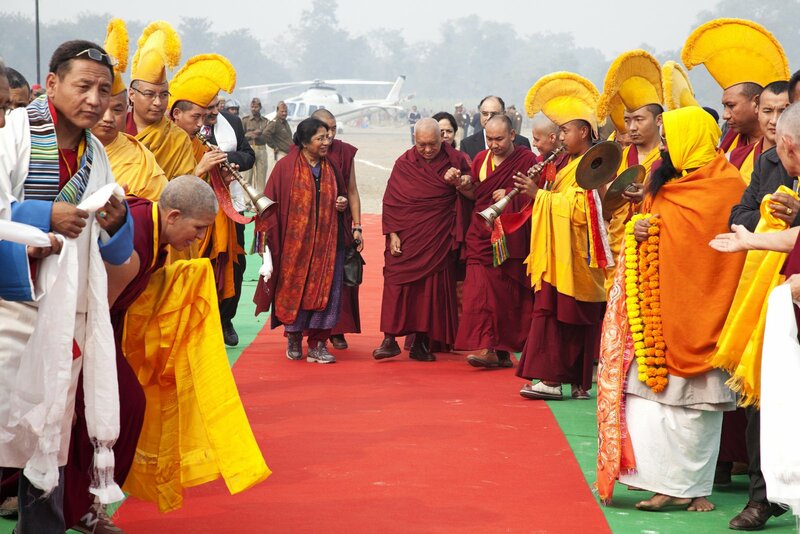 Lama Zopa Rinpoche arriving at Kushinagar, India, December 13, 2013. Photo by Andy Melnic. What started out as a wish of FPMT founder Lama Yeshe to build a very large Maitreya Buddha statue in India has blossomed into two separate and distinct projects to build very large Maitreya Buddha statues: one statue in Kushinagar in the state of Uttar Pradesh and one in Bodhgaya in Bihar. The Bodhgaya project statue will have Maitreya in the enlightened aspect (cross-legged) and the Kushinagar project will have Maitreya in the bodhisattva aspect (sitting with his legs down). In this issue of Mandala, we have an update on the project in Kushinagar. In our next issue, we hope to have an update from Bodhgaya. My very dear students, kind benefactors, friends and others who have compassion for sentient beings – not just compassion, but taking responsibility to free all sentient beings from the oceans of samsaric sufferings – to all, I am expressing hello and hope you are all well. Now we have two Maitreya Projects. As you may have already heard, Maitreya Project Bodhgaya has started and the process is happening, but now the statue will be smaller; this is due to the situation of the world and my advice.Maitreya Project Bodhgaya has been taking a long time; the reason is that there were many, many obstacles. Mandala’s ongoing coverage of the Maitreya Project can be read online.